I have two parrots, Neelix and Kes (yes, my StarTrek geekiness is showing). The first is a normal cockatiel male, the second is a blue-headed Pionus parrot female. They have lived with us for over 15 years. 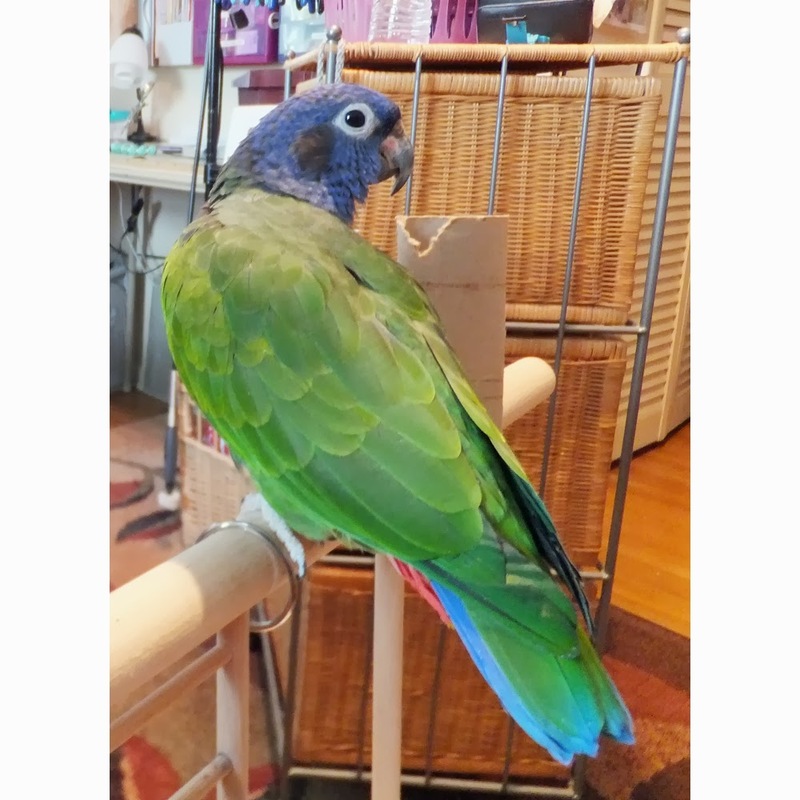 Parrots typically molt (shed old feathers to make room for new) several times a year. I'm blessed with beautiful gray and white (Neelix) and mostly green (Kes). She also has magnificent tail feathers that are tri-color, blue, red and green. I especially watch for these on the cage bottom, not only because they are so unusual, but because I've wanted to do something polymer-related with them for some time. This is Kes, visiting the studio. You can just see the red portion of her tail feathers. Last week, she also gifted me with some tiny, delicate mostly red feathers that I knew would be wonderful layered with the tri-color. So, making sure that I had both "right" and "left" pieces (they are actually a bolder color on the "front"), I constructed a layered polymer base of navy blue, red center and green, textured back. With custom sterling earwires and findings, these earrings practically made themselves! Susan they're wonderful! (both the earrings and the bird) ;) Looking forward to seeing what you create from Neelix's feathers. Thanks, Beth! Working with his classic gray and white will be fun! Great names! And I love the earrings! What wonderful earrings! I think birds are so inspirational I used to collect our macaw feathers mostly green with some small yellow ones. Thank you, Jackie! They ARE so beautiful!